toronto, yyz, flight deals, england, europe, united kingdom, western europe, air transat, lisbon, portugal, lis, southern europe, netherlands, london, italy, paris, france, cdg, rome, fco, dublin, ireland, dub, amsterdam, ams, barcelona, spain, bcn, athens, greece, ath, southeastern europe, venice, vce, glasgow, scotland and gla. 49 Responses to "Mistake Fares: Toronto to Paris, Amsterdam, Dublin, London and more places in Europe - $113 to $378 CAD roundtrip including taxes "
Yup, tried a few times but error message comes up! Still some - Sp. 9 - 16th for $323 RT. Just tried it on Expedia. It keeps giving me an error message saying that there are no longer any seats available. I see the price but get an error when I try to check out (expedia). I think they caught the mistake. The website isn't loading after the flights are chosen. I tried and it took me all the way to processing my transaction, but then it states that the flight is sold out. FYI London seems to have similar prices in October/November. Searched on google flight, booked on flight network successfully. I was able to book Oct 6 - 17 with FlightNetwork for 2 adults. I just booked through flight network and it appears to have gone through for $274 cad. I tried a couple different dates. It allowed me to get all the way to the reservation (the last click) and then it says "sorry that flight is no longer available". Bummer. Has anyone had experience of the airline not honoring these "mistake fare"? We were able to book via CheapoAir. The ticket prices are in fact in CAD dollars. We have our flight confirmation via text and email so we'll see if anything changes. Was able to book with FlightNetwork May 2018 to Amsterdam. $475 RT for 2 adults. We'll see if it actually gets ticketed. Booked for November 14-21 out of Montreal for $368 RT for TWO adults with ExploreTrip. Not expecting this one to get ticketed but payment went through! I almost had Toronto to Dublin booked, but at the last step it said prices went up. Air Transat is in the middle of legal hearing because of their bad handling of a flight diversion back in July that left passengers stranded for 5 hours. I wouldn't trust booking with this airline. I've had a bad experience in the past with them. ^^^ That's the most ridiculous thing I've heard in a long time. If you stop flying every airline where something went wrong, you won't be flying anywhere. 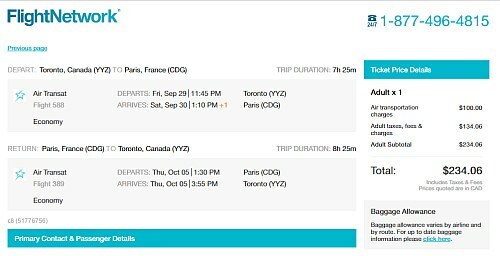 I just booked an hour ago, Toronto to Paris return for $305.00 October 20-29. I got an e-ticket confirmation, no charge yet to credit card. Expedia had problem, booked from cheap flight as $240 return to Paris Oct 5-13th. Serge, which site was that through? FlightNetwork: I booked Toronto to Dublin for $389 for two around 3 pm but got cancelled at 5:30 pm. Tara, I got it through momondo.ca and booked through Explore Trip. Booked RT to Paris for two Nov. 23-29 this afternoon for $348. CC charged through Flight Network and I have confirmation number. Awaiting tickets. Expedia - For those who received an e-ticket #, the bookings seem fine. 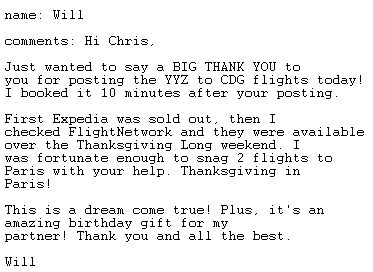 It seems like most who booked through Expedia did receive an e-ticket #. Expedia is generally one of the best sites to book through in a mistake fare situation. Unfortunately they did not last very long on Expedia! Flight Network - For those who did not receive an actual e-ticket #, the bookings have been cancelled. Generally what happens in mistake fare situations is that the earlier bookings are issued an e-ticket #. Then at some point, the mistake is fixed, and bookings made after that point do not have e-ticket numbers issued. FlightHub - I haven't heard of any cancellations. Those who received e-ticket numbers seem to be fine so far. CheapOAir - I haven't heard of any cancellations. Those who received e-ticket numbers seem to be fine so far. 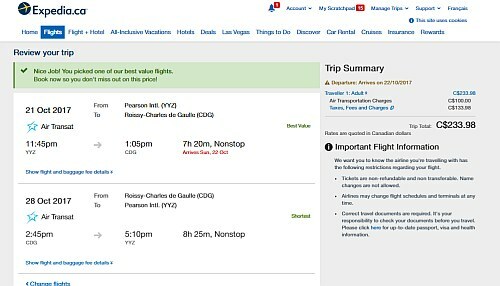 I booked through BMO rewards ( which books through expedia) I received the email right away and its showing on airtransat website and there is an eticket number in the email , should I be okay? FlightNetwork called approx. 6 hours later and cancelled :( I'll be on the hunt still! Booked deal on CheapOAir.ca and so far so good. We have 2 tix going to Paris in Oct 14-20 and haven't received cancellation. Ticketed on Air Transat with the confirmation number on both sites. Crossing fingers. 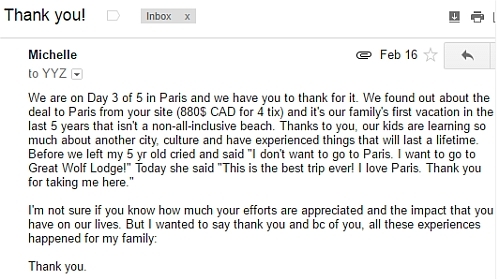 Hi, I jumped on and tried to book the deal from Toronto to Paris to no avail. When I noticed the stopover in Montreal and decided to take a chance and see if I could fly direct from Montreal sure enough the prices were 199$ (1 stopover in Toronto on the way back) or 254$ return from Montreal to Paris (direct flights both ways). When I could not seem to book it on Expedia.ca after about 1 hour and a half of trying, I flipped onto Expedia.com and was able to book 2 tickets immediately for 436$ USD total. I received 2 emails confirming plus a 13 digit itinerary number so I am assuming all is good?!? Its too bad the deal did not show up on YUL deals on time but I follow YYZ for this exact reason that sometimes YYZ deals go live first but YUL is not far behind! Thank you for this site... hoping everything goes through! Got an email from flight network today. My ticket got canceled. Booked YYZ-PAR via Flight Network and received e-tickets today CAD179 return. I booked on Priceline.com and the iteniery is till active on their website. How do I know if air transit will cancel? My priceline.com summary has a 6 digit air transit confirmation code and ticket number. Am I good? I rather not call them. I figure the longer the ticket is active, the more they will have to honor it? Ashif: At this point (5 days after the mistake fare event), I would say anyone with an issued ticket is good to go. Thanks Chris. Love your site. Love finding flights deals. This will be the 3rd time to Europe in less than 14 months.